Three Way Cube is a three-dimensional brain-twister. There are chances on all three levels. It is a version of play of Scour Four. 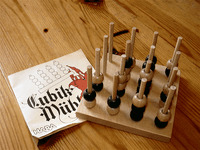 The rules are similar to the rules of the mill-game. After the lots have been drawn for white and brown, each player receives 32 beads. Now both players by turn try to build up a vertical, horizontal or diagonal line. As soon as a player has built a mill he may take away a bead from his opponent. It is, however, only allowed to take beads which are seizable directly, that means which are on the top of a pin. If a mill is closed you may not take away a bead from his mill. The aim of the game is to take all beads from the opponent or to block his beads in such a way that he cannot move any longer.